When should a kerosene heater wick be replaced? The wick is the heart and soul of a kerosene heater. The heater itself may be very old, but if the heater has been well cared for, all it needs is a new wick to begin life anew. A nearly new heater in perfect condition, but with a bad wick or contaminated fuel, will not burn well and produce clean, odor free heat as well as a century old heater with a new wick! The wick sleeve for an unpinned wick has sharp barbs on the inside to hold the wick in place. 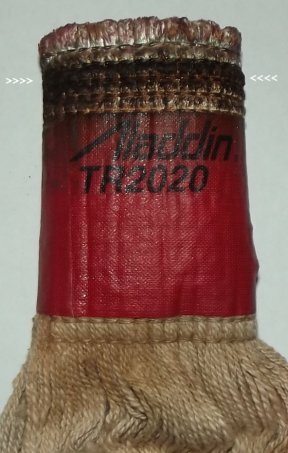 The pins (if any) are on the sleeve itself. Pinned wick sleeves have 3 holes for the pins on the wicks to go through, as shown above. Click on the photos to enlarge them. The heater wick should be the correct wick for your heater, not a generic model sold for the convenience of some local hardware store clerk who never used a kerosene heater in his life. The wick should also be made by a long-time reputable replacement wick manufacturer such as Hattersley in England, or an OEM factory wick. 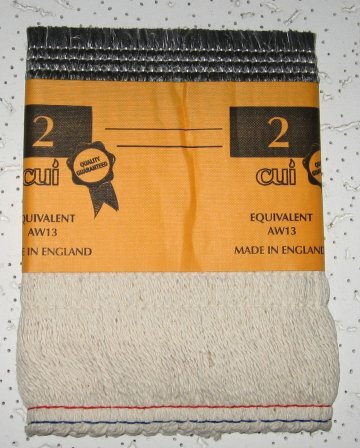 Quality CUI replacement wicks made by Hattersley often cost half the price of an OEM wick, and work just as well. The main concern is correct wick size and thickness and the inherent quality of the wick itself. Not all wicks are created equal. A wick which is too thin (too cheap) will cause excess vaporized hydrocarbons (kerosene vapor) to pass through the wick gap, overloading the catalytic converter and causing smelly burning characteristics. Every day I receive e-mail from people who want to know what is wrong, guessing it is bad fuel. It is the wick. They "saved" money by buying a cheap wick and are in a Kero-World of hurt. And they didn't save money! The wick was $2.00 less than I sell them for, postage was $2.00 more, so the actual cost was the same PLUS now they have to replace the cheap wick with a quality wick engineered to burn properly, just so they can live in the same house with the heater. I will not sell cheap wicks, as a kerosene heater will not operate properly with a lousy wick. 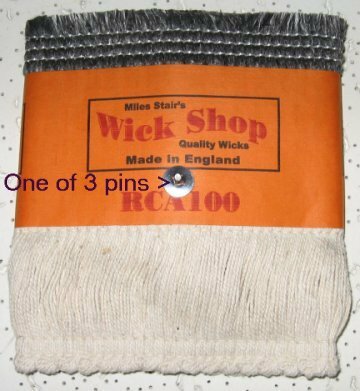 The wicks I sell are made in England by the company which made Aladdin wicks for the past century and is the current OEM supplier of Toyotomi and Corona wicks in Europe, and they have optimized the fiberglass fiber thickness and density to adsorb kerosene readily yet not burn on top, thus lasting longer than thinner fiberglass fibers. If you absolutely depend upon your kerosene heater to heat your home, your heater needs regular maintenance - and that includes wick replacement every year. 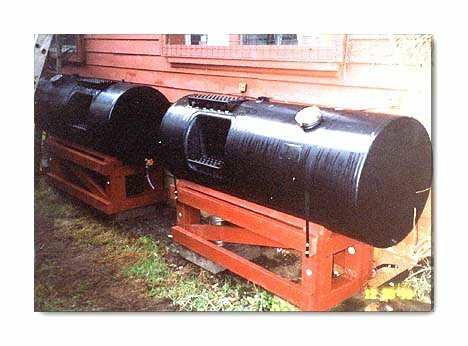 People who heat with wood have their chimney cleaned, those who heat with a furnace replace the filters when needed, and kerosene heaters need wick replacement to function at full efficiency. 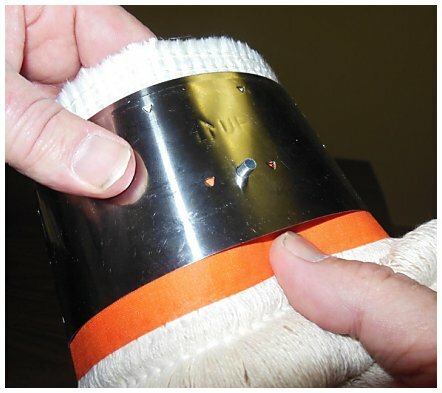 "Fiberglass" wicks have a top section which is fiberglass fibers mated to a lower section of cotton fibers. The two sections are joined with an orange cloth band (shown above). Fiberglass wicks are exceptionally tough and long lasting. The ratty looking top section photographed at left was from an old, beat up wick I burned in a trash fire! The fiberglass is intact but no trace remained of the cotton filaments and cloth band. This is why a fiberglass wick can be burned "dry" without harm. After the wick is burned dry, examine the top of the wick. If it is thin and ragged, it's time for a replacement. If the wick appears to be fine, but then burns with a ragged-edged flame or the flame does not reach up to curl around the top plate on the catalytic converter by at least 1/2 inch, it's replacement time. If the heater is hard to start even after dry burning the wick, feel the side of the top edge of the wick you can reach: If the wick is hard instead of supple, then tar formation inside the wick means it's time to replace the wick. This is also indicated when the flame does not spread quickly around the entire wick after lighting. If the wick has water contamination to the extent that the flame is the right height for awhile, then burns irregularly and of uneven height, it's time to replace the wick. Note, however, that this condition can be caused by poor quality kerosene, so check that by using new, clear kerosene. If the wick has not been "burned dry" and the tar on the wick becomes too thick, the wick can tear when retracted to turn off the stove, and the wick must be replaced. If the wick will not retract and continues to burn, take the heater outside and blow out the flame. If the flames will not blow out, the heater may need to be covered with a wet blanket to smother the flame. Do not spray the heater with water! Hot metal can warp when hit with cold water, and the glass cylinder chimney used on most radiant heaters will shatter. Then follow the directions below. "Burning dry" fiberglass kerosene heater wicks is important to their efficiency. If the wick does not raise and lower smoothly, it is time to burn it dry. It is best to visually examine the wick after every use: if you see tar balls on top of the wick it is time to burn dry. After the stove has cooled down, remove the catalytic converter, raise the wick and gently crush the top of the wick with smooth faced paddle bladed pliers. My favorite pliers for this use is the Ace Hardware "Flat Nose Pliers" #ACE2004216. The wick should then retract. Reassemble the heater and remove all fuel. With a convection heater that means siphoning out the fuel. A side-tank radiant can simply have the tank removed. Replace the catalytic burner unit. Raise the wick to maximum height. Light the wick and make sure the catalytic converter burner unit is in place. Let it burn completely out. First the fuel in the wick burns, then the tar, and in an hour or so the wick is again in pristine condition. Because this process will produce some odor, it should be done outside or under cover (garage with the door open, etc), with no wind, as a strong draft can blow out the weak flames burning tar deposits in the final 10 minutes of the dry burn. How long does it take to burn the wick "dry"? That depends entirely upon the heater design. 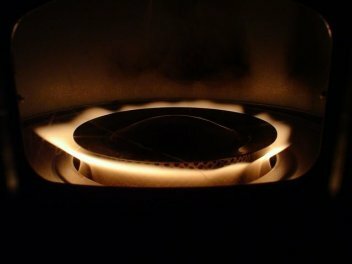 Convection heaters must have their fuel tanks siphoned empty, so they usually take less than an hour to dry burn the wick. Most radiant heaters have a side fuel tank which can be removed - but you cannot empty the sump under the wick. A Corona SX-2E will burn the wick dry in a little over an hour, as will the Heat Mate HMHR 1101. The Toyotomi RCA-87 has a huge sump, and can still be burning "dry" after 3 hours! Toyotomi solved that problem with the Radiant 40; it has a very shallow sump and burns dry within an hour...but the shallow sump can easily spill fuel when the heater is moved, so do not tip it when carrying! How often to "burn dry" a wick? There are a lot of factors involved here. A new or nearly new wick burning "water clear" 1-K kerosene should use at least 30 gallons of fuel before needing to be "burned dry." When using red dye kerosene, some lots of the fuel the wick will not need to have the wick burned dry for up to 15 gallons of kerosene consumed, while other batches of red dye kerosene are bad enough to require burning the wick dry after every 10 gallons of kerosene. The red dye can cover up a lot of sins. Make sure you lower the wick after burning dry. If the wick is "up" after dry burning and you refuel and leave it up, then fuel can "wick" into the catalytic converter and cause excessive smoking during startup. If your heater lights properly, then the flame dwindles and goes out, there are usually two causes to explore. The primary cause is water in the wick or contaminated fuel. While sitting unused, the wick can absorb enough fuel to light and burn for up to 20 minutes or so, then the capillary action is insufficient to sustain the burn. This is covered below. The second possibility of dwindling can be a carbon or tar deposit down an inch or so from the top of the wick - an obvious black ring around the wick. This is caused by burning the heater with the catalytic converter not properly seated, so air is admitted at exactly the wrong place, or by having the wick set too high (pinless wicks). If the wick is not a rigid type*, remove the wick, place a 2 x 4 through the wick, then using a rubber mallet, gently pound on the ring to break up the carbon deposit within the wick. Do not strike anywhere near pins or clips, of course, or they may be damaged. A carbon deposit that low on the wick will not burn dry! (See photo above) The wick will work, poorly, until you can obtain a new replacement wick. A rigid wick* cannot be even temporarily fixed in this way and must be replaced for the heater to again work properly. Remember that the capillary action of wicks is virtually destroyed by water...cotton in particular will absorb water, then the lighter kerosene is denied a capillary "path" to the top of the wick. Performance (clean, odor free heat output) is seriously degraded by even a little water in the kerosene. If you find yourself with only cloudy kerosene and no alternative fuel available, the kerosene can be slowly filtered through a chamois cloth in a large funnel. Wring out the chamois and repeat until the fuel is clear. Or if you're high tech, funnels which filter out water are readily available. The usual problem with a wick not lighting is that it has absorbed water from the fuel. A kerosene heater stored over the summer with fuel in the tank, even a little fuel, can induce condensation. As little as a teaspoon of water absorbed by the lower cotton portion of the wick will inhibit the capillary action of the cotton fibers and result in a wick which will not light simply because fuel is not available to the fiberglass fibers on top of the wick. See water in the kerosene. Changing the kerosene in the fuel tank does not effect the water already present in the wick. Correct adjustment of flame height for kerosene heaters, usually with the wick set just less than a half inch showing at maximum height adjustment. To find a wick for a common brand name heater, use the alphabetical list. 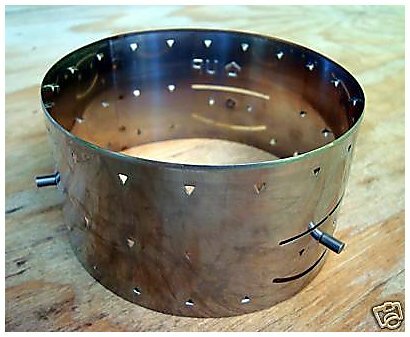 To find a wick for a really odd or rare kerosene heater, perhaps with a peculiar brand name, you will have to measure the existing wick diameter and length, following the directions I have provided, then e-mail me with the measurements. I can almost always find a wick that will fit precisely.